Mumford River Lodge merged here, 09/03/2017. R. W. Jonathan Learned, M.
W. Jeremiah Kingsbury, Jr., S. W.
W. Reuben Barton, J. W.
The first meeting recorded In the simple annals of Olive Branch Lodge was held on the first day of May, 1797, "at the Hall of Lieut. Samuel Campbell, in the town of Oxford." For the thirteen previous months the Brethren had assembled, once each month, for the purpose of "lecturing and the transaction of such other matters of business as needed their attention." The real history of the Lodge, therefore, dates from April, 1796. We may observe in passing that no mention is made of the election of a Chaplain. Let it not be presumed, however, that prayers were thought to be unnecessary in those early assemblies, for the record soon shows that the Lodge availed itself of the services of an officer so indispensable in a Masonic Lodge. At this meeting a committee was chosen to petition "the Grand Lodge for such recognition and approval as is needed, and to grant a Charter, or Warrant, under which they could proceed as a regular and duly organized Lodge of Master Masons." While.the Lodge waited "recognition" and the receipt of the Charter, meetings were held twice each month, at which the Brethren perfected themselves in the mysteries of the Craft, or, as the record expresses it, "passed the lectures of the various degrees in Masonry." On the 28th of August it was "voted to meet on the last Monday of each month at two P.M., at Campbell's Hall, Oxford," and on the 31st of the same month it was voted "that a copy of the record of the first meeting be given to the committee for the purpose of preparing a petition to the Grand Lodge." The Charter bears the date of September 14, 1797, and the honored names of Paul Revere, as Grand Master, and Isaiah Thomas, as Senior Grand Warden. On the 25th of September, at Campbell's Hall, in Oxford, the Brethren met for the first time as a regular and duly authorized Lodge, having a Charter, or Warrant, empowering them to work. At this meeting several committees were appointed: one to prepare a code of By-Laws for the government of the Lodge, another to procure jewels for the Officers, and to attend to the "trimming and flooring" of the Hall, another to obtain the "wooden implements" necessary for the practical working of the Lodge. "It was further voted that the permanent Hall, when erected, shall be located within three-fourths of a mile of the dwelling-place of Jonathan Davis, On the road leading from Jeremiah Davis', Oxford, to Major Samuel Waters', in Sutton." Although the Lodge seemed to be now fairly launched on its promising voyage, there was one important item lacking to its locker, without which its course would prove rough and rugged. It needed cash, that indispensable requisite for every new undertaking. The Lodge had a Treasurer, but no Treasure. To overcome this difficulty the careful pilots appealed to the more affluent Brethren, and three of them, Davis, Learned and Whitmore, generously responded and loaned the Lodge the magnificent sum of twenty dollars. Who asked those Brothers there to meet?" This Mr. Davis was the most prominent man of his day in that section of the State. He was twice chosen Presidential Elector for this District, first in 1825 and again in 1829, voting both times for John Quincy Adams, the Prince of anti-Masons. The "Mansion large," with its "rooms complete," is still in existence, a worthy and historic relic of those times. It will well repay a visit by members of the Fraternity, who will be treated courteously and instructively by its present owners and occupants. It has in one room an old-fashioned repository, which a local authority described to your committee as a " Bo-fat." To Brethren interested in the study of etymology this word may afford food for reflection. At one meeting five candidates were received, the degrees being denominated as "steps," and to Brother Reuben Barton is extended a vote of thanks "for the acceptable gift of three candlesticks," showing that the Brethren were grateful for more light, and wrought by the aid of three burning tapers, probably placed in a triangular position in the Lodge. March 28, 1798, seven candidates were raised to the sublime degree of Master Mason, a stretch of labor unknown in these days. A later date records the election of officers for the year. "There were present twenty-five members and eight visiting Brethren." This meeting was in the day-time, and points two facts, the increasing prosperity of the Lodge, and the devotion and earnestness of those hardy old sires, who in the spring-time left their farms to attend to their Masonic obligations and consequent duties. Various events are noted as the Lodge gains years and members. St. John's Day is again observed, this time June 24. Twenty-three members and sixteen visiting Brothers were present, surely taxing the capacity of the "Mansion large and rooms complete." "Under the peaceful shade of your Olive Branch may you find refreshment. Fair be its promising flowers and plentiful its rich fruits. And may the salutary oil it distills heal all the wounds, which care, trouble or calumny may make in your hearts, and, like the precious ointment on the head of Aaron, make your face to shine with gladness, and diffuse far around the grateful and reviving perfume of honor, praise and glory. Peace be within the walls and prosperity to the interests of every Lodge. Peace to the Brethren, and may the God of peace, Himself, give us peace always by all means." To the venerable and Reverend Brother's eloquent peroration, let us all say—"Amen, so mote it be." This was the first public installation service observed by the Lodge. It was held in the Universalist Meeting House in Oxford, which is still standing, the oldest Universalist church edifice in the world. "My respected Brethren in Masonry, you will permit me to present you with this great light. May it guide you to all truth. May the benign principles which it contains have the happy effect to efface and finally eradicate from the bosom of every Brother all deceit and selfish prejudices, so that you . may walk hand in hand as becomes the disciples of the Great Friend of Mankind." The record of April 17, 1799, discloses the author of the name of the Lodge, as at that meeting "the thanks of the Lodge were extended to Jonathan Harris for giving a name to this Lodge." Let us, my Brethren, supplement that vote of thanks with ours, for the name Olive Branch, so euphonistic, descriptive, truthful. Things practical had their place in the proceedings of the Lodge, as well as things of sentiment and morals, for it was directed "that one pair of breeches be obtained for the use of the Lodge, and also one half gross of marbles," — the latter were not intended for the amusement of those grave and venerable men, but were allotted to more necessary and serious uses. "My respected Brethren, with your permission I will make a few observations, as a duty incumbent on me. You will pay the strictest attention not to have communication from each other at this Board or within these walls, but what is compatible with our By-Laws, while at our laborious employment. "And you, my beloved Stewards, will cause the Lobby door to be closed only on necessary occasions which your wisdom will dictate. Should any Brethren have any business of a common avocation they will retire. The house is large and commodious, and they will be accommodated. If any of the Brethren wish for home before the Lodge is closed, they are at their option. But I will observe, they must be mindful where they have deposited their outward clothing, so as to retire with a low and still voice, for that is the mark of a Mason, and a demonstration of the love of God." For this bit of practical exhortation, the Lodge voted the Orator its "most cordial thanks." In these early years of struggle and comparative poverty, the Lodge did not neglect the true Masonic virtue of Charity, for we find it on several occasions contributing "to the relief of sufferers by fire," and ministering to the necessities of widows and orphans of deceased Masons. The internal adornments of the local domicile were not forgotten, as the records relate that "necessary furniture was secured to raise and make Masons." The merits of faithful workers also received the attention of the Brethren, as "Brothers Kingsbury and Learned were voted the thanks of the Lodge for their good and faithful services rendered while presiding in the East." This old record appears, which perhaps some one of our wiser Brethren will be able to explain: it was voted to suspend "a Brother's seat for one year in the Lodge." A sense of justice controlling, it was voted to "refund to Brother Campbell $5.00 for a bad bill he took from the Lodge." Thus the doubtful blessing of State Banks may have affected the finances of the Lodge, further illustrated in the fact that the Lodge directed "That a Committee be raised to see to the loaning of the money of the Lodge." There were no Savings Banks then to care for surplus cash. The Treasurer's account at this period indicates the careful supervision of the financial affairs of the Lodge, a record showing in 1807, $404.87, and in 1810, $565.16, quite an increase from the time when three Brothers were asked to loan the Lodge the sum of Twenty Dollars. It is to be presumed that the money loaned had been returned with thanks. This satisfactory financial condition did not, however, beget a feeling of careless security, for a little later we find a record that Brother Sumner Barstow was invested with the double dignity of acting as "our attorney and committee to collect all moneys due to the Lodge, to be collected by the first of November next, or be put in Suit." This Sumner Barstow was one of the gentlemen commoners of that time. He was a lawyer in the "old grab law time," but his kindly feelings made the profession so distasteful to him that he relinquished all its honors and profits, and was appointed cashier of an Oxford Bank. The History of Sutton records "that he was an affable, gentlemanly, kind-hearted man." This incident is recorded in the same history: Esq. Barstow, while listening to a sermon by Rev. Mr. Mills, took out his penknife and scraped and cleaned his finger nails, which apparent inattention annoyed the preacher, drawing from him a mild rebuke. So the next day Esq. Barstow sent a handsome apology, accompanied with the entire sermon written out. This retort courteous tasked the suave Mr. Mills to a suitable reply, which, however, he sent with grace and dignity. The records of these years indicate constantly increasing prosperity. Large attendances are reported, and many Masons made. Eight candidates were received at one time. Indeed, so prosperous had the Lodge been, it was decided to build a Hall exclusively for its own use, and after much canvassing of the matter a new Hall was built, probably as an L to the famous old hostelry at West Sutton. The total cost was $1,205.68, and some of the items are amusing: "To several journeys to Worcester to 'git' Mr. Stiles, $7.00. To J. Stiles, for Painting, $60.00." This Mr. Stiles was considered an artist in his day. He is supposed to have been drowned in an attempt to swim under the old floating bridge at Quinsigamond Lake. It is recorded that he adorned the walls of the Hall with three large, beautiful figures of Faith, Hope and Charity. But, alas! the lapse of time, the ruthless hand of ignorance or utilitarian necessities have completely destroyed or buried the artist's careful and gracious work. Remains of the old Hall are still in existence: the old arch, the original benches, made of rough boards, with lifting tops and set sharp and hard against the walls. The lockers under the seats have become repositories for odds and ends rejected and valueless; and a closet where formerly the Brethren deposited the secret paraphernalia of the Craft — the trappings and pabulum of the mystic goat — is now known in profane parlance as the "cathole." In the new Hall the Lodge vigorously pursued its work, although it is surmised that the proximity to refreshment supplies induced more conviviality than was profitable. But the times were in part at fault for any lapses in this direction. Certain it is that some of the Masonic virtues did not become obsolete, for we find "a widow aided in her need," an unworthy Brother made the subject of "consideration," which resulted in his expulsion from the Lodge and a notification of it published in the Massachusetts Spy and National Eagle. The fact of one "horse baiting" is made matter of record and the income therefrom itemized, 16 cents; certain notes were voted to destruction on "account of the death of the maker," and others were surrendered, to the amount of $116.12, "because the signers had been unfortunate, and it would be an hardship to compel payment." But business is not neglected, even while charity ruled these kindly hearts, for it was voted "that all bills of all Banks be accepted from initiates except from the Banks in Hallowell and Augusta, Me. "; the impecuniosity of the clergy is recognized in that it is ruled that "the clergy be exempted from the payment of quarterages." In the year 1821 the wealth in things of bulk is so noticeable that it is decided " to buy a trunk to keep the clothing and properties of the Lodge in." In the year 1822 the Lodge is again moved, not, however, without a struggle and some heart-burnings and recriminations. A strong majority favored the removal to Jacob March Hall, and in September, 1822, the Lodge is meeting there. Whether or not a lesson had been learned and virtuous ideas had become more dominant, deponent saith not, but we find this notable, and we doubt not wise, decision recorded: Voted that we have a dinner at the expense of the Lodge, and that we have but two refreshments of liquor at the expense of the Lodge." And then, no doubt, to offset this pampering of their stomachs and to indicate that it did not blunt their perceptions of duty, it was directed that "a donation of ten dollars be made to the sufferers by the late fire." The curious inquirer will wonder which was the greater tax on the treasury, the feast of reason and the flow of Medford rum, or the donation to charity. "Charity covereth a multitude of sins." Perhaps in this instance it was a palliative or anodyne to conscience. "It was voted to invite Rev. Mr. Mills to come into the Hall and make a prayer, which he did, in the presence of the Fraternity and other inhabitants of the neighborhood." The Centre Hall, like the West Sutton Hall, is still in existence, fashioned somewhat like the former one. It is put to better uses, however, as it has passed into possession of the town, and is used as an educational domicile, "for the more noble and glorious purpose" of teaching the young idea how to shoot and instructing stalwart young men and graceful young ladies " how to meet upon the Level and part upon the Square," or perchance to meet and never more to part. June 24, 1824, we find the Lodge celebrating St. John's Day in Benedict Hall in Millbury. There were present thirty-nine members and sixty-nine visitors. The record recites that "on this occasion a procession was formed and it proceeded to the meeting-house where a discourse was delivered by Companion Benjamin Wood, of which a copy was 'requested but refused.' After which they returned whence they came and partook of a sumptuous entertainment, accompanied by the ladies and several neighboring clergymen." It; must be that the ladies had begun to assert themselves a little more than formerly, for this stands as the first record of the fair sisterhood being invited to grace the gatherings of the Brethren. This Benedict Hall was situated at the place now called the "Old Common." The meeting-house where the discourse was delivered is now the place of worship used by the First Congregational Society located in the west part of Millbury, called Bramanville. The first Masonic funeral of which there is record took place in Benedict Hall over the remains of Brother Rufus Carter. On April 19, 1825, the Brethren living in Oxford applied for and received a recommendation for instituting a new Lodge in that town. Brethren in Dudley also asked and obtained aid in instituting a Lodge there. It was "voted to grant the request of our Dudley Brothers, and also to attend the ceremonies of the Grand Lodge in instituting the new Lodge in Oxford." The remarkable growth of the Order is further indicated by the formation of a Royal Arch Chapter in the town of Sutton. The Treasurer was instructed to collect arrearages due the Lodge for the purpose of making a loan to the Chapter, and the Chapter was permitted to use the Hall. Indeed, so rapid had been this growth that the Lodge was finally induced to consider its own needs, for we find this record: Considering the increase of Masonic Associations and the multiplicity of meetings, we would recommend that instead of holding monthly meetings, we meet on the Mondays preceding, or at the full of the moon, in February, May, August and November, at nine o'clock A.M., and the February meeting shall be the annual for the choice of officers." A charity committee was chosen, and records are frequent of responses to the many demands made upon the cash box. The American Colonization Society was given $10. A like amount was refunded to Jonas Sibley "who has aided a Spanish Exile," and this quaint record is found: "It is the heart-feeling of the Lodge to contribute to the relief of a destitute Brother and his family,"' the heart-feelings being expressed by the gift of $20. The newly formed Chapter is also aided, the sum of $250 being loaned to it at different times. February 1, 1830, is an interesting date in the history of the good Olive Branch Lodge, for it is the first in which any allusion is made to the anti-Masonic craze. Of course the Lodge had its perplexities, its defections, its cowans. Its experience was the same as that of all Masonic Lodges in that strange time, like charges, aspersions and hatreds, but through it all there was a growth of the best elements. No surrender of Charter here, no hiding of jewels and cessation of meetings. 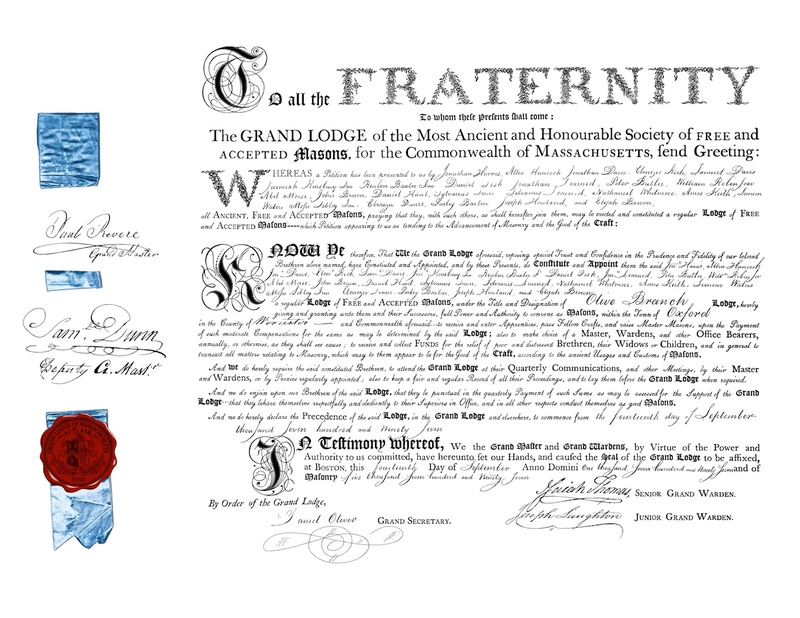 The grand old Charter signed by grand and courageous men infused into the hearts of its keepers like courage and vigor. Not one regular meeting was passed. And whether few attendants or many, the Lodge was properly opened, business regularly transacted, and then the Lodge closed, and the record put upon the books. It was a time which tried men's souls. But these men and fathers whom we honor to-day stood the trial, and deserve our most exalted encomiums. Three among the number deserve. especial and emphatic mention, and the respect of Masons: DANIEL TENNEY, SAMUEL WILLIAMS, SIMON TENNEY, JR. The records show a variety of proceedings during this time of unrest, but nothing that is not honorable and praiseworthy. Committees were appointed to "look into the conduct of Masons within the jurisdiction of the Lodge, and to report facts and articles when obtained." "An unworthy Mason was deprived of his privileges and expelled." Jonas L. Sibley, a United States Marshal under Jackson's Administration, and worthy of his high honors, "gave an appropriate address on Masonry." The Brethren "attended to thoughts on Masonry and anti-Masonry, and at its close they retired to Mr. Whiting's, and took a good supper of Turkey, etc., etc., etc., etc." The imagination may supply the various condiments and liquids indicated in the multiplied "etc., etc., etc." Well, considering the period, we hope the persecuted Brothers had a good time and enjoyed their etc., etc., etc., whatever they represent. At one meeting "seventeen Brethren are reported in attendance and seven new members were admitted." Another record reports "twenty-five Brethren present, and contributing $32.50 to the cause of. charity." Induced, perhaps by some of the anti-Masonic fire, to be more circumspect in their ways, or, perhaps, influenced by a growing temperance sentiment, and constantly regarding the good of the Lodge, "it is directed that the bottles, decanters and tumblers, and other articles not needed in the Lodge, be sold." Perhaps virtue would have had a larger reward if these implements had been destroyed, but they were not, they were sold. However, a larger praise awaits our honored sires, for they direct that from this time, 1834, "no liquors shall be drunk in the Lodgeroom." Thus early did they legislate that all license and excess should be avoided, and to build up the Lodge in all which constitutes truly Masonic virtue and principle. Under date of November 18, 1839, the Lodge "canvassed the expediency of resuming work," and expressed itself as follows: " As we have a candidate ready to be made a Mason, it was thought best to proceed with our work, as the excitement in regard to Masonry has subsided altogether, and the reason for our stopping work is done away, and the anti-Masons are modified enough at the oppressive steps taken in regard to Masonry, and as we are a benevolent Society, we will endeavor to use them with all the politeness we are capable of (or, rather, what they can bear), and proceed with our work." The flattering unction which the Brethren laid to their souls was not justified at once, for the records show that though the Lodge held each regular meeting, yet there was a scarcity of work, and this condition of things continued for a considerable time. Yet Masonic principles stood the test put upon them, for we find in the year 1842 this record: " A Dispensation having been granted to Knight Templars to meet as a Commandery in the town of Sutton, it was unanimously voted that the use of Masonic Hall be granted them." This action was characteristic of the Lodge. It did not stop to consider results or possible contingencies. Here were Brothers of another and higher department of the Masonic Order needing the exercise of the fraternal spirit; and in accordance with its action towards the Chapter and Council, so now it welcomes Templars to its place of retreat and extends to them the most cordial welcome. We hope the Sir Knights of Worcester County Commandery will not despise "this day of small. things," but will give the good Olive Branch its due credit for this generous hospitality and protection, and if the need should arise they will do as they were done by. In the year 1844 the Lodge is once again uneasy because of its location, and after extended discussion decided to remove to the village of Wilkinsonville. A year later, in 1845, the Lodge met in Wilkinsonville for the first time. It continued there for a period of six years. They were not prosperous years. The attendance was small and but few Masons were made. During this time, also, the Hall in Sutton Centre became a bone of contention, exercising the wisdom and ingenuity of various committees until January, 1851, when it was sold and passed out of the possession of the Lodge. "Having seen the Lessee of the Hall, he says we cannot have it at the same rent as heretofore, and not being able to make any arrangements with him, and no suitable place can be found nearer than Tourtelotte Hall at West Sutton, and as he offers it free of rent, the furniture of the Lodge has been removed to that place." So we find the Lodge back in its old place of meeting. Whether or not the action of the owner of the Hall was purely generous and free from the mercenary taint admits of doubt. It may be that an expected generous patronage of the landlord's et ceteras was an inducing reason for his course. At any rate the Lodge had not yet found its place of fixed abode, for we find about this time that a committee, consisting of three Brothers, was chosen, one from each of the towns of Sutton, Grafton and Millbury, "to take into consideration the subject of fixing the place of meeting of the Lodge in future." This action culminated in a division of the Lodge. Grafton petitioned for a Charter through Ithran Harris and others. The Charter having been granted, a committee was raised to divide the funds of the Lodge. The good Olive Branch, ever justifying its reputation as a generous donor, gave to the Lodge at Grafton the sum of one hundred dollars, in addition to its hearty Godspeed. The records at this period indicate that the Lodge was in good condition, the attendance creditable, work frequent, and surplus cash in the locker, as we find a record of one hundred dollars deposited in the Worcester Savings Bank. The records also show that a final resting-place had not, been found yet for the Lodge, as there are reports of meetings alternating between Webster and West Sutton. Eight meetings were held in Webster, when it was voted that all subsequent meetings be held in West Sutton. This was in August, 1858, and the vote remained unrescinded until December, 1859, when at a regular meeting it was voted "that the Lodge be removed to Millbury provided the Grand Lodge will grant leave." This action the Grand Lodge indorsed, and the old Charter was so amended as to give the Lodge leave to hold its meetings in the town of Millbury. On January 7, 1860, the Lodge suffered its last, and let us hope final transplanting, when it was removed to its present location. The place of meeting was in the old "Arcade" and the rent was thirty dollars. Brother Asa Woodbury was present at this first meeting in Millbury and presided in the East, honoring the position he had filled for many years. The record of October 27, 1860, does credit to the Lodge, and honor to this esteemed and beloved Brother. "Brother Asa Woodbury, who had been Master so long, refused a re-election, when by a unanimous vote of the Brethren present, a tender of thanks was extended to W.M. Asa Woodbury for his faithful services as Worshipful Master, and for the continual interest manifested by him in his labors for the prosperity of Olive Branch Lodge. It was ordered that our venerable Brother be requested to procure a well-executed portrait of himself at the expense of the Lodge." The action of the Lodge was subsequently carried out, and a portrait of the honored Brother was hung upon the walls of the new Hall, where it remained until destroyed in the burning of the Hall. On October 25, 1865, the Lodge was called upon to attend the beloved Brother's funeral, thus closing the Masonic record of one whose example as a Mason is worthy of our emulation. His age was upwards of three score and ten years, and he was a member of Olive Branch Lodge for a half century. The record of November 19, 1866, shows the desire of change working once more in the current experience of the Lodge. Its prosperous years, a plethora of cash, pride in its record arid history, all prompt the desire for new, larger and more sumptuous apartments. So the matter was canvassed by the Brethren, and a committee was chosen "to see about securing new accommodations, as present quarters prove inadequate for the use of the Body." The desire was gratified, and on April 22, 1872, we find the Lodge occupying a new Hall, called Masonic Hall, in a block of buildings known as the "Rhodes and Simpson Block." The Hall was situated in about the same place as the present one. The rooms were beautifully adorned with "net work, lily work and pomegranates," and in all their appointments were adequate and well adapted to the increasing wants and demands of the Brethren. It met all' the needs of the Body in its enlarging and substantial prosperity, — a prosperity which even the long, tedious years of the Civil War had not hindered nor retarded. The Lodge for the first time in its history was fittingly housed and felt permanently at rest. The Hall was dedicated on the 25th of April with the usual Masonic rites by the Most Worshipful Grand Master, Sereno D. Nickerson, accompanied and assisted by the members of his official suite. In remarks made at the dedication the Grand Master warmly congratulated the Lodge on its achievements, the energy, zeal and liberality displayed in furnishing and fitting the Hall, and emphasized the notable fact that the Lodge is one of the very few in this jurisdiction that retained its Charter and organization during the anti-Masonic excitement and persecution." The amount expended was $2,888.33, and illustrates the generosity and ungrudging affection of the members for the good old Olive Branch. It will be readily understood that in the new and elegant habitation of the Lodge, the "trunk" which had so long sufficed to hold secure the properties of the Body would not answer for present needs, so it was ruthlessly and, as events proved, wisely relegated to things of the past, and a commodious safe was substituted. In the new Hall the Lodge took on increased activity and growth. Many Masons were made. Peace and harmony prevailed. So well was all its work and business conducted that it received from visiting officials and Brethren the heartiest words of commendation. But it had been in its new location only a few years when its prosperity and. apparent security suffered a sudden eclipse. Hitherto the migratory spirit had led the Lodge to removals in accord with its will, but now it is to migrate against its will. The story is told under elate of March 13, 1882: "On this date the regular Communication was held in Grand Army Hall, the Hall in which the Body had met for ten peaceful and prosperous years, having been destroyed by a disastrous conflagration. After remarks had been made by Brethren, deploring the fate whereby we lost our beautiful Masonic home by fire, on the morning of March 11, 1882, it was suggested and ordered that a page in the record be set apart as a memorial of the fire." Everything was consumed in the untoward holocaust, excepting the records, the ancient and highly prized Charter, the Junior Warden's chair, the Bible from the Altar, and the Master's Square which was rescued from the ashes. The loss of one valuable memento was, and ever will be, a matter of deep regret to the Lodge: a fine Bible, the gift of one of the signers of the Charter, a man whom all Masons honor, our respected Brother Isaiah Thomas. This experience was a discouraging one for the Lodge. Fortunately, an adequate insurance had been placed upon the property of the Lodge, so that it. was saved from total loss, and was thereby enabled to refurnish the present Hall with but little extra expense. Through the courtesy of the officers of the G.A.R. Post No. 70, of this town, which was thoroughly appreciated, the Lodge was afforded temporary quarters. Here they remained for nearly two years, until a new Hall was completed on the foundations of the old. On the evening of February 28, 1884, it was dedicated by Grand Master Abraham H. Howland, Jr., assisted by his official suite, with the customary, beautiful ceremonies. Though the weather was unpropitious, 109 Masons were in attendance, and at the subsequent banquet, (minus the "two refreshments of liquor"), 135 members and invited guests partook of the plentiful cheer. We have no need to praise the beauty of the new and present Temple in which the Lodge assembles. It is its own testimony of the fitness and beauty of its adornment and adaptation to the needs of the several Masonic Bodies meeting within its pleasant retreat. Very many useful and beautiful articles were presented to the Lodge, among the number a beautiful and well-appointed bookcase given by the Brethren of Worcester Lodges. The records from this time on indicate growth and prosperity. Many Masons have been made and become members of the Lodge. Charity has been freely practised, and a charity fund of eight hundred dollars has been accumulated. December 13, 1886, the old and highly prized Charter, the oldest memorial and most valued the Lodge possesses, was photographed and a copy graces the walls of the Lodge-room. Let all who behold it endeavor to imitate every virtue practised by those whose signatures embellish it. The apartments have recently been equipped with electric lights which add to their beauty and convenience. Water has been introduced as one of the things needful, and the rooms are heated by steam. Thus equipped, the Lodge feels proud of its Masonic Home and abiding-place. We invite you all, Brethren and friends, to rejoice with us in that our "lines have fallen in such pleasant places and that we have so goodly an heritage." There are no scandals or quarrels to disparage the Lodge before the community. May it ever be said of the members, "Behold how good and how pleasant it is for brethren to dwell together in unity." In closing their review, your committee desires to testify its heartiest admiration for those fathers and Brothers who wrought so well and truly in the practical work of the Lodge, and so thoroughly exemplified the ethical principles of the ritual of the Order. It is to be remembered and emphatically marked that during the entire century, each and every regular meeting of the Lodge was opened and closed in due form, and a record made of the fact and of the business transacted. So, the record of the Lodge is, a veritable and true record of one hundred years, with no hiatus, intermission, nor blank. We meet in this grateful hour to record the virtues of these praiseworthy men and fathers, to admire their virtues and worth, to emphasize their Masonic zeal and perseverance against great odds, and to hallow their memories. Masonry and all it illustrates was clear and close to their hearts. In exemplification of it and its high tenets they wrought in truest fortitude. They have handed those tenets 'down to us, their heirs and assigns. Let us, then, so labor and live that we may keep untarnished in purity and unimpaired in vigor those principles which they illustrated when they planted the Olive Branch good and true, this vigorous vine of Masonic growth and brotherly love. Before there was any Town of Webster, it not being incorporated until 1832 and formed from parts of both Oxford and Dudley, the first Masonic body in the vicinity was Olive Branch Lodge, of Oxford. A movement was made for its formation early in 1797, and in May Officers were chosen. A committee was elected to petition the Grand Lodge for a charter and a vote passed to hold meetings monthly on Mondays at 2 o'clock in the afternoon. A charter was granted the 14th of the following September. On the 25th of that same month the Lodge very ambitiously voted to build a hall in Oxford near to West Sutton where a large part of the membership was located. No hall was built but the house of a Mr. Davis near the West Sutton line was chosen as the regular meeting place while the Lodge remained in Oxford, with occasional meetings at the Tavern hall on the Plain. In November, 1797, it was voted to pay Brother Jonathan Davis ?24.00 per year for the use of the hall furnished and warmed. On September 13, 1798, the Officers were installed at the "new" meeting house now world famous as the oldest Universalist Church, the first of that denomination to be built. The members met at Campbell's Tavern where the procession was formed and at 12 o'clock marched to the church where after a sermon by Thaddeus M. Harris the ceremony of Installation was performed. The procession returned to the hall and "from thence to a booth prepared for the purpose and partook of an elegant dinner." In November, 1814, a new hall was projected and a committee chosen in August, 1815, to finish and furnish it. The new quarters were built at West Sutton and were first occupied on February 21, 1816, the Grand Lodge having given leave for the change. In March, 1845, it was again removed to Wilkinsonville. In December, 1856, permission was granted to hold meetings alternately at Sutton and Webster. After September 8, 1858, "Or after the formation of Webster Lodge," all meetings were held in Sutton. On December 14, 1859, the Most Worshipful Grand Lodge granted leave to remove Olive Branch Lodge to Millbury, which was done in 1860, and it has since continued there. On the walls of its Lodge room hangs its Charter signed by Paul Revere, Grand Master. By Worshipful Gustav A. Neudeck. In presenting this history of Olive Branch Lodge, we will only attempt to give a brief resume of the more permanent history which is still in course of preparation. When completed, it will include a much more detailed account of the happenings of the Lodge, covering a period of 151 years, beginning with 1796 to the present time. The actual history of Olive Branch Lodge began in April, 1796, when a group of Masons, names not recorded, foregathered in Oxford to consider the feasibility of a Masonic Lodge — not a small undertaking when we consider the times and condition of the nation in that period. Their deliberations covered a period of thirteen months, until May 1, 1797, when they proceeded to organize, formally, but tentatively, in traditional Masonic order. They chose a moderator, Daniel Fisk, and then in turn elected a board of officers: namely, Jonathan Learned, Master; Daniel Fisk, Senior Warden; Jonathan Davis, Junior Warden; Sylvanus Learned, Secretary; Sylvanus Town, Treasurer; Jonathan Harris, Senior Deacon, Jeremiah Kingsbury, Jr., Junior Deacon; Nathaniel Whitmore and Peter Butler, Stewards; and William Robinson, Tyler. The proceedings were conducted in Campbell Hall in Oxford. Their petition for a charter was presented on August 28, 1797, and the charter was issued September 14, 1797. That charter bears the names of two truly illustrious Americans — Paul Revere, Most Worshipful Grand Master, and Isaiah Thomas, Right Worshipful Senior Grand Warden. The first regular meeting of Olive Branch Lodge was held September 25, 1797. Plans were made to arrange a code of By-Laws, to procure jewels for the officers of the Lodge, to attend to the floor and trimmings of the lodge-room and to procure the wooden implements necessary to the practical and efficient proceedings of the Lodge. It was voted at this meeting that the "permanent hall, when (and if) erected, shall be located within 3/4 of a mile of the dwelling place of Jonathan Davis in Oxford, on the road leading from the Jeremiah Davis place in Oxford to the Major Samuel Waters residence in Sutton." The location specified was probably a compromise between Sutton and Oxford members. The Jonathan Davis Mansion was called Freemason's Hall and it still stood intact at the centennial celebration in 1897, but has since been destroyed by fire. The Lodge occupied these quarters for eighteen years. On June 24, 1798, the Lodge observed St. John's Day in Campbell Hall in Oxford. On the same date a public installation of officers was held in the Universalist Church in Oxford. This church still stands. It is the oldest Universalist Church in the world, dated 1727, according to a sign it bears. At this installation, a sermon was preached by Right Worshipful Rev. Brother Thaddeus M. Harris, Chaplain of the Grand Lodge of Massachusetts, and of the Grand Chapter, Royal Arch Masons, as well. He closed his discourse with this benediction: "Peace be within these walls and prosperity be the interest of every Lodge. Peace to the Brethren and may the God of Peace Himself, give us Peace always, by all means." In the present days of world unrest and insecurity, let us reverently respond: "So mote it be." On April 17, 1799, the Lodge acquired its name — Olive Branch Lodge. Brother Jonathan Harris was the proponent and it is recorded that the Lodge gave him a vote of thanks. About this time we note an entry in the records which needs no explanation — "It was directed that a pair of breeches and a half gross of marbles be procured for Lodge use." On January 23, 1800, Olive Branch Lodge, together with Morning Star, Meridian Sun and Fayette Lodges, united with the military forces in and around Oxford and participated in a program of funeral honors in memory of George Washington, who died December 14, 1799. All through the proceedings of the Lodge runs the golden thread of charity, as we read from time to time of donations and contributions indicating that this cardinal principle of Freemasonry was ever alive and active. The Lodge treasury in 1807 showed a balance of $404.67, and in 1810 it stood at $565.16. About this time, the exact date was not recorded, the Lodge decided to erect its own building. The plan originally proposed was for an exclusive edifice, but instead, it was built as an ell or annex to the Major Waters Tavern in West Sutton. Its location conformed to the original restrictions. It stood about three-fourths of a mile from the Davis Mansion, on the road leading from West Sutton to Webster. The total cost, including painting and transportation of the painter to and from Worcester, is placed at $1,205.08. The new quarters proved adequate at this stage of the Lodge's career, but there was one drawback — its proximity to the tavern's taproom did not prove conducive to sobriety and decorum in the Lodge meetings. In 1822, after much opposition, the Lodge decided to change its location. We speculate whether the convenience of the tavern taproom entered into the discussion. In September, 1822, the accoutrements and attachments of the Lodge were removed to Jacob March Hall in Sutton Center. The dissension that arose over the removal culminated in the decision to build a new Masonic Hall elsewhere. Negotiations were entered into with a Sutton School District, which finally resulted in building a combination school and lodge hall in January, 1824. This building still stands near the Sutton Town Hall and is now used exclusively as a school. On April 19, 1825, the Brethren of Oxford applied for and received permission from Olive Branch Lodge to institute a Lodge in that town. Shortly thereafter, the Masons of Dudley sought similar permission, which was also granted. We also note at about this time the formation, in Sutton, of a Chapter for the conferring of Capitular degrees. In 1830 the first manifestations of the unrest attending the so-called Anti-Masonic agitations became apparent in the Lodge. We attempt no descriptions of the violent acts of the period and only record that Olive Branch Lodge continued to meet, unobtrusively to be sure, but courageously, throughout. No meetings were passed. It is a source of gratification that Olive Branch Lodge No. 39 of Le Roy, New York, similarly stood by its guns and met regularly, and it is credited historically with preserving Masonry in Western New York. In 1845, the Lodge again yielded to its migratory impulses and moved to Wilkinsonville, which quarters it occupied for six years, after which it returned to the old abode in West Sutton. In 1857 and 1858 a proposal to change its location again resulted in a serious division of the Lodge. The Grafton members, headed by Ithran Harris, a Past Master of Olive Branch Lodge, petitioned the Grand Lodge for a charter, which was granted. A committee was appointed to divide the funds of the Lodge, which was satisfactorily accomplished, and Olive Branch generously added ?100.00 to Grafton's share as a gesture of good will. January 7, 1860, after many months of discussion and after permission had been received from the Grand Lodge, Olive Branch Lodge finally settled in Millbury, its home ever since. At this time, quarters were established in the old Arcade Building. In 1872, the Lodge moved to a new building which was erected in the very center of Millbury by Messrs. Rhodes and Simpson, members of the Lodge. This building was commodious, and handsomely decorated and fully met the requirements of Olive Branch Lodge. It seemed that at last the migrations of the Brethren would cease. But, alas for human hopes! On the morning of March 11, 1882, the Lodge lost practically all its possessions in a fire which levelled the building. Fortunately, in 1860, the Lodge had purchased a steel safe to replace the old trunk which had been used previously, and all the records of the Lodge, the Altar Bible and the precious Charter were saved; also the Master's Square was later retrieved from the ruins. For the next two years, the Lodge met in G. A. R. Hall, at the end of which time a new brick building had been erected, on the site of the one previously destroyed, which was also designed for Masonic quarters. On the evening of February 26, 1884, the lodge-rooms were dedicated by Most Worshipful Abraham H. Howland, assisted by his official Suite. These rooms have been occupied by Olive Branch Lodge to this day. January 30, 1892, marks the death of Cyrus T. White. This bears recording because he was then ninety-one years old and had been a member of the Lodge for sixty-seven years, since 1825, the year that Oxford Lodge began its existence. On September 12, 1897, the Lodge opened its Centennial Celebration by attending a church service in the First Unitarian Church in Millbury, where a long and interesting discourse on the subject Masonry and the Centennial of Olive Branch Lodge was delivered by Rev. Brother William L. Walsh, Pastor of the Church. On September 14, 1897, the Lodge's 100th Anniversary meeting was opened with Worshipful Master Charlie C. Lougley presiding in the East. After the regular business was transacted, a resolution of thanks to Brother Matthew J. Whittall was adopted for his generous gift of a carpet for the outer rooms. Immediately afterwards, Most Worshipful Charles C. Hutchinson was escorted to the lodge-rooms by a committee headed by Right Worshipful Irving B. Sayles. After the reception, the Lodge was adjourned to the Town Hall where a banquet was enjoyed by all. After the banquet, a program of music and speeches was carried out and the Centennial Celebration passed into history at eleven p.m. There are today only two living members of Olive Branch Lodge who were present at this celebration — Worshipful Gustav A. Neudeck, to whom we shall be eternally grateful for the work he is now completing on the history of Olive Branch Lodge, and Brother Cornelius E. Putnam, who received his fifty year Veteran's Medal this year from the hands of Right Worshipful Brother Harris. As may be easily understood, the first one hundred years of the Lodge's life are by far the most interesting. As we turn to the last half century, we find mostly routine business of the Lodge. However, there are several incidents which are of real interest to us all. In September, 1898, the Lodge voted to remit the dues of Brother Walter Rogers to October, 1899. He had enlisted in the Volunteer Army of the United States. Brother Rogers was the only member of the Lodge to take part in the Spanish American War. At the communication of May 13th, 1901, the Lodge voted to purchase a portrait of Paul Revere, Most Worshipful Grand Master when Olive Branch Lodge was chartered — a commendable action, too long delayed. At the annual election in 1901, Brother Gustav A. Neudeck, who is the historian for this celebration, was placed in the East, where he served for two years. In November of that year, the Lodge received word that the Misses Clara E. and Mary T. Randall of Boston, great granddaughters of Isaiah Thomas, intended to present the Lodge with an oil painting of their great grandfather, whose name, like that of Paul Revere, adds authority to our charter. On April 18, 1906, the news of the catastrophe which befell San Francisco stunned the civilized world. It became a tale of tremendous loss of life and property. Upon receiving news of the calamity, the trustees of our Lodge immediately wired $100.00 to the Grand Master of Masons in California, an action which was unanimously ratified by the Brethren. We not/, an entry in 1910 which states that eleven Past Master's Jewels were purchased at a total cost of $395.00. Imagine that! On April 10, 1911, the Lodge conferred Honorary Membership on William Howard Taft, President of the United States, and on September 14, 1912, he paid the Lodge a short visit. On February 26, 1914, Worshipful Nathan H. Sears passed away in his eighty-fourth year, and in September of that year, the Lodge was presented a crayon portrait of him by his daughter, Miss Anna M. Sears. This portrait, together with that of Isaiah Thomas, which was presented by his great granddaughters, and that of Paul Revere, which the Lodge purchased, still hangs on the walls of our lodge-room. The Bi-Centennial of Masonry in America was celebrated by Olive Branch Lodge on Sunday, June 24, 1917, by attending St. John's Church, Wilkinsonville, where it listened to a discourse on St. John the Baptist by Rev. Preston Barr, Pastor of the church. It is noted that "during the absence of Wor. Master Lewis T. Clementson, who was in the Armed Forces, Harry W. Thompson presided in the East as acting Master." A bronze plaque in the lodge-room commemorates the members who served their country in World War I. In October of 1918, there occurred an event unprecedented in Masonic history. By order of Most Worshipful Leon M. Abbott, Grand Master, the October 14th communication was omitted because of the prevailing epidemic of influenza. Also in 1918, Brother Rufus R. Crane finally and definitely refused further re-election as Secretary. He had held that office for forty years, and had become a valuable storehouse of Masonic information. His successor was Brother William F. Chase. Brother Crane passed away the following year in his seventy-fourth year. In the years immediately following the first World War, we note particularly the continued flow of petitions. It seems to be an aftermath and related to the harshness and vicissitudes experienced in war and a desire to experience the quiet, social atmosphere of the lodge-room. Under date of November 3, 1921, a communication from the Grand Master was read in the Lodge which cleared up the question of when and where George Washington was made a Mason. It stated that our "distinguished brother received Masonic Light at Fredericksburg, Virginia on November 4, 1752." During the next few years the Lodge prospered and gained in membership. We also notice that it took care of all charitable obligations very generously. The communication of December 9, 1928, was a momentous one. It was recorded that the Lodge purchased the Armsby building, bringing to a close long negotiations incident to acquiring the property. The records of 1940 show a special communication being held on February 7th to honor Right Worshipful Eric A. Jacobson, who had been appointed District Deputy Grand Master — the first such appointment to be accorded Olive Branch Lodge in thirty-five years, since the late Right Worshipful George J. Dudley had held that distinguished office. During the last few years, the Lodge has progressed favorably. In 1943-44, through the efforts of a Mortgage Reduction Fund Committee, the mortgage on its building was considerably reduced. In that same year, it participated in the drive for funds for Masonic Service Centers. A number of its members have served in the recent World War II, notably our present Junior Warden, who held that office when he was called to the colors. Now we are celebrating our 150th anniversary. Let us hope that Olive Branch Lodge will go on for many years to come as it always has — Faithfully, Hopefully, Charitably, but particularly Charitably. The actual history of Olive Branch Lodge began in April, 1796, when a group of Masons, names not recorded, foregathered in Oxford to consider the feasibility of a Masonic Lodge, not a small undertaking when we consider the times and the condition of the nation in that period. Their deliberations covered a period of thirteen months until May 1, 1797, when they proceeded to organize, formally but tentatively, in traditional Masonic order. They chose a moderator, Daniel Fisk, and then in turn elected a board of officers: namely, Jonathan Learned, Master, Daniel Fisk, S. W., Jonathan Davis, J. W., Sylvanus Town, Treas., Sylvanus Learned, Sec, Jonathan Harris, S. D., Jeremiah Kingsbury, Jr., J. D., Nathaniel Whitmore and Peter Butler, Stewards, and William Robinson, Tyler. The proceedings were conducted in Campbell Hall in Oxford. Their petition for a charter was presented on August 28, 1797, and the charter was issued September 14, 1797. That charter bears the names of two truly illustrious Americans: Paul Revere, Most Worshipful Grand Master, and Isaiah Thomas, Right Worshipful Senior Grand Warden. The first regular meeting of Olive Branch Lodge was held September 25, 1797. Plans were made to arrange a code of By-Laws, to procure jewels for the officers, to attend to the floor and trimmings of the lodge-room and to procure the wooden implements necessary to the practical and efficient proceedings of the Lodge. It was voted, at this meeting, that the "permanent hall, when (and if) erected, shall be located within three-quarters of a mile of the dwelling place of Jonathan Davis in Oxford, on the road leading from the Jeremiah Davis place in Oxford to the Major Samuel Waters residence in Sutton." The location specified was probably a compromise between Sutton and Oxford members. The Jonathan Davis mansion was called Freemasons' Hall and it still stood intact at the centennial in 1897, but has since been destroyed by fire. The Lodge occupied these quarters for eighteen years. On June 24, 1798, the Lodge observed St. John's Day in Campbell Hall in Oxford. On the same date a public installation of officers was held in the Universalist Church in Oxford. At this installation a sermon was preached by Rt. Rev. Bro. Thaddeus M. Harris, Chaplain of the Grand Lodge of Massachusetts and of the Grand Royal Arch Chapter as well. He closed his discourse with this benediction: "Peace be within these walls and prosperity be the interest of every Lodge. Peace to the Brethren and may the God of Peace Himself, give us Peace always, by all means." In the present days of world unrest and insecurity, let us reverently respond "So mote it be." On April 17, 1799, the Lodge acquired its name, Olive Branch Lodge. Bro. Jonathan Harris was the proponent and it is recorded that the members gave him a vote of thanks. The Lodge treasury in 1807 showed a balance of $404.67, and in 1810 it stood at $565.16. About this time, the exact date was not recorded, the Lodge decided to erect its own building. The plan originally proposed was for an exclusive edifice, but instead, it was built as an ell or annex to the Major Waters Tavern in West Sutton. Its location conformed to the original restrictions. It stood about three-quarters of a mile from the Davis mansion on the road leading from West Sutton to Webster. The new quarters proved adequate at this stage of the Lodge's career, but there was one drawback. Its proximity to the tavern's tap room did not prove conducive to sobriety and decorum at meetings. In 1822, after much opposition, the Lodge decided to change its location, and in September of that year, the accoutrements and attachments of the Lodge were removed to Jacob March Hall in Sutton Center. The dissension that arose over the removal culminated in the decision to build a new Masonic Hall elsewhere. Negotiations were entered into with a Sutton School District which finally resulted in building a combination school and Lodge Hall in January 1824. On April 19, 1825, the Brethren of Oxford applied for and received permission from Olive Branch Lodge to institute a Lodge in that Town. Shortly thereafter, the Masons of Dudley sought similar permission, which was also granted. In 1830 the first manifestations of the unrest attending the so-called Anti-Masonic agitations became apparent in the Lodge. We attempt no descriptions of the violent acts of the period and only record that Olive Branch Lodge continued to meet, unobtrusively to be sure, but courageously, throughout. No meetings were passed. In 1845 the Lodge again yielded to its migratory impulses and moved to Wilkinsonville, which quarters it occupied for six years, after which it returned to the old abode in West Sutton. A proposal to change the location again in 1857 resulted in a serious division of the Lodge. The Grafton members, headed by Ithran Harris, a Past Master of Olive Branch Lodge, petitioned the Grand Lodge for a charter, which was granted. On January 7, 1860, after many months of discussion and after permission had been received from the Grand Lodge, Olive Branch Lodge finally settled in Millbury, its home ever since. At this time, residence was established in the Arcade Building. In 1872 quarters were obtained in a new building erected in the center of Millbury by Messrs. Rhodes and Simpson, members of the Lodge. This building was commodious and handsomely decorated and fully met the requirements of Olive Branch Lodge. It seemed that at last the migrations of the Brethren would cease. But alas for human hopes! On the morning of March 11, 1882, the Lodge lost practically all its possessions in a fire which levelled the building. Fortunately, in 1860 the members had purchased a steel safe to replace the old trunk which had been used previously, and all the Lodge records, the Altar, Bible and the precious charter were saved. Also, the Master's Square was later retrieved from the ruins. For the next two years the Lodge met in G. A. R. Hall, but on the evening of February 26, 1884, the present home of Olive Branch Lodge was dedicated by M.W. Abraham H. Howland, Jr., assisted by his official suite. On September 14, 1897, the 100th Anniversary meeting was opened with Wor. Charlie C. Langley presiding in the East. Most Worshipful Grand Master C. C. Hutchinson attended the meeting which preceded a banquet and program of music and speeches conducted in the Town Hall. As may be readily understood, the first one hundred years of the Lodge's life are by far the most interesting. As we turn to the last half century, we find mostly routine business. However, there are several incidents which should be of real interest to us all. At the communication of May 13, 1901, the Lodge voted to purchase a portrait of Paul Revere, Most Worshipful Grand Master when Olive Branch Lodge was chartered, a commendable action, too long delayed. At the annual election in 1901, Bro. Gustave A. Neudeck, to whom we shall be forever indebted for the compilation of our history, was placed in the East. In November of that year, the Master received word that the Misses Clara E. and Mary T. Randall of Boston, great granddaughters of Isaiah Thomas, intended to present the Lodge with an oil painting of their great grandfather, whose name, like that of Paul Revere, adds authority to our charter. On April 18, 1906, the news of the catastrophe which befell San Francisco stunned the nation. Upon receiving news of the calamity, the trustees of our Lodge immediately wired financial aid to the Grand Master in California, an action which was unanimously ratified by the Brethren. All through the proceedings of the Lodge runs the golden thread of charity; as we read from time to time of donations, contributions and assistance indicating that this special principle of Masonry was ever alive and active. Masters' jewels were purchased at a total cost of $395.00. On April 10, 1911, Olive Branch Lodge conferred Honorary Membership on Bro. William H. Taft, President of the United States, and on September 14, 1912, he paid the Lodge a short visit. The Bi-Centennial of Masonry in America was celebrated by attending St. John's Church in Wilkinsonville, where the Brethren listened to a discourse on St. John the Baptist by Rev. Preston Barr, Pastor of the Church. In 1917 it is noted that "during the absence of Worshipful Master Lewis T. Clementson, who was in the Armed Forces, Harry W. Thompson presided in the East as Acting Master." A bronze plaque in the lodge-room commemorates the members who served their country in World War I. In 1918 Bro. Rufus R. Crane finally and definitely refused further re-election as Secretary. He had held that office for forty years. Under date of November 3, 1921, a communication from the Grand Master was read in the Lodge which cleared up the question of where and when George Washington was made a Mason. It stated that "our distinguished brother received Masonic Light at Fredericksburg, Virginia, on Nov. 4, 1752." The communication of December 9, 1928, was a momentous one. It was recorded that on November 22 the Lodge had purchased the Armsby Building, bringing to a close long negotiations incident to acquiring the property. In March 1930 a committee was elected to take charge of the real estate of the Lodge. Two of the members of this original committee, Bro. Warren B. Harris and Wor. Bro. George A. Russell have served the Lodge in that capacity ever since that day, and their untiring efforts have culminated in our meeting tonight. As we all know, the "thirties" were lean years for everyone, and our Lodge was no exception. We note an entry at the annual meeting in 1934: "Due to the fact that all of the monies of Olive Branch Lodge under the care of the Trustees, was used to reduce the first mortgage on our property, the Trustees have no detailed report to make." You will note the reference "first mortgage." Oh yes, we had two. However, in the early 1940's things began to brighten. During 1942, 3 and 4, several committees worked hard at redecorating the interior of our quarters, and a Mortgage Reduction Fund Committee succeeded in soliciting sufficient funds to make a substantial reduction in our mortgage. During this same period, of course, a number of our members were serving in the Armed Forces and, in an effort to add a little pleasure to their lives, we note that the members who were not serving made substantial contributions to the maintenance of a Masonic Service Center at Fort Devens. Olive Branch Lodge attained the 150th anniversary of its institution on September 14, 1947. During the long years of its existence, its light may have dimmed a little at times, but it has never gone out. In recent years it has operated vigorously and progressively. Like the fabulous bird of mythology, it seems to renew itself periodically. The anniversary celebration was opened with a service at Millbury Federated Church on Sunday afternoon, September 14th. R. W. Thomas S. Roy was the principal speaker, assisted by Rev. Mont M. Thornburg, Pastor of the Church. R. W. Bro. Roy has since become M. W. Bro. Roy. On Monday evening, September 15th, a banquet and program of speeches was held in the Millbury Town Hall, which was attended by M. W. Grand Master Samuel H. Wragg and his suite of Grand Officers. Tonight, after twenty-eight years of hard financial effort and 159 years of history, Olive Branch Lodge is free again of mortgage indebtedness, and its members are justly proud of the home they own. Will you all join with me in saying: "So Mote It Be." The petitioners named were: Jonathan Harris, Allen Hancock, Jonathan Davis, Ebenezer Rich, Samuel Davis, Jeremiah Kingsbury, Reuben Baxter, Jr., William Robinson, Abel Morse, Daniel Fisk, Jonathan Learned, Peter Butler, John Brown, Daniel Hunt, Sylvanus Town, Sylvanus Learned, Nathaniel Whitmore, Amos Keith, Simeon Waters, Moses Sibley, Jr., Ebenezer Deane, Parley Barton, Joseph Howland and Elijah Brown. On the 27th of September 1797, it was voted that the hall for the use of the Lodge, when built, shall be set within three-fourths of a mile of the house of Jonathan Davis. The house was the well-known Davis Homestead No. 12, and this vote indicated that a large share of the membership was in Sutton. No hall was built in this town, but the house of Davis was thereafter the regular place of meeting during the continuance of the Lodge in Oxford. Occasionally meetings were held in the Town Hall on the Plain. In November 1797, it was voted to pay Brother Jonathan Davis $24 a year for the use of the hall furnished and warmed. On the 13th of September the before-named officers were duly installed at the Universalist Church (the new meeting house). The members met at Campbell's Tavern, whence the procession marched at 12 o'clock to the meeting-house, where, after a sermon by Thaddeus M. Harris, the ceremony of installation was performed. The procession returned to the hall and thence to a booth prepared for that purpose and partook of an elegant dinner. In November 1814 a new hall was projected and, in August 1815, a committee chosen to finish and furnish the same. The new quarters were built at West Sutton and were first occupied the 21st of February 1816. On the 15th of September 1815, leave was given to remove the Lodge to Sutton. In March 1845 it was again removed to Wilkinsonville. In December 1856 permission was granted to hold meetings alternately at Sutton and Webster. After the 8th of September 1858, all the meetings were held in Sutton. On the 14th of December 1859 leave was granted to remove to Millbury. Early in 1860 the removal was made and the Lodge has since continued there. I have heard it said that Paul Revere came up from Boston to institute and constitute Olive Branch Lodge. By Worshipful Randolph G. Mogren, Jr. It is given to few fraternal organizations to attain 175 years in age. This evening Olive Branch Lodge commemorates that proud distinction. To attempt to look back at the many events and accomplishments in the short space of a few minutes is a most difficult task. Herein contained is only a summary of the efforts of countless brethren. What stands out more than any single fact is the dedication and sincerity of our membership. These men of character have shaped and molded a history of our distinguished Lodge that all may justly be proud. The actual history of Olive Branch Lodge begins in April, 1796, more than a year before its official recorded history. In those preliminary months a group of gentlemen, presumably Masons, gathered together to discuss Masonic matters. They met regularly for thirteen months in what must be described as spade work. Finally, on May 1, 1797, the first formal organization was effected which four months later was to become the future Olive Branch Lodge. On that date the founders assembled in Campbell Hall in Oxford and proceeded to organize. To obtain a true perspective and a keener appreciation of the antiquity of our Lodge let us glance back 175 years to the time that group of ancient brethren assembled in Oxford to discuss Masonic matters. The new nation was not yet a decade old. George Washington, that splendid patriot, leader, and Mason was serving the last year of his second administration. When the permanent organization was formally organized in 1797, John Adams was our President. That new nation was still in a process of adjustment to its new status as a Union. Civilization was found only along a fringe of country bordering on the Atlantic Ocean. From North to South it averaged only 100 to 150 miles inland. The pioneers had not yet begun the westward expansion over the Appalachians to the Ohio Valley. Beyond the settlements was a wilderness of virgin forests, wildlife of every description, and the American Indian. Communication was difficult and infrequent. Travel was by foot, horseback, or by boat and canoe along the lovely rivers and streams of America. Such was the country of 1797 when Olive Branch was born. Our charter was duly granted and bears the date of September 14, 1797. On September 25th the Lodge held its first meeting under its charter in Campbell Hall, Oxford. But though it was now a regular and duly constituted Lodge it was nameless. That situation was remedied in due time. Historically, the charter was signed in 1797 by Most Worshipful Paul Revere, Grand Master of Masons in Massachusetts. During his term of office Paul Revere signed twenty-three charters of which nine were signed, in 1797. A second illustrious name is contained on our charter — Isaiah Thomas. Mr. Thomas was a patriot and minute-man, publisher of the Worcester Spy, and Senior Grand Warden of the Grand Lodge. It was he who read the Declaration of Independence from the steps of Old South Church on Worcester Common. It took genuine moral courage to perform that deed in those perilous revolutionary days. On September 13th, 1798, the first public ceremony of officers being installed was held in the Universalist Church in Oxford. This church is the oldest Universalist Church in the world, a great distinction for the humble edifice which appears not to be too keenly appreciated by Oxford or the Universalist bodies of today. Brother Jonathan Harris was voted a warm thank you on April 17, 1799 for providing a name for the new Lodge. In just what words the name was presented is not a part of our records. The name was presented simply as "Olive Branch". It is too bad that the symbolism of the olive branch could not apply to the world situations of today. It could be as simple if men would live by the principles of our Fraternity. The treasury statement for 1807 showed a balance of $404.87 and its statement for 1810, $565.16. Also, during this period, the Lodge directed that a committee be raised to see to the loaning of the money of the Lodge. The observation is made that no savings banks existed then. That appointed committee would be considered a board of investment today. Sometime between 1815 and 1820 the Lodge, finding its treasury full, decided to build the hall it so long considered necessary. This it proceeded to do at a cost of $1215.08 but the structure was not individual or exclusive. It was built as an annex to an old tavern in West Sutton, the Samuel Walter's Tavern. The records do not so state if attendance showed a#marked improvement. That we must therefore, leave to the imagination of the assembled brethren! They do state however, that the Lodge continued to prosper in its new environment but intimated that its proximity to the tavern taproom was not conducive to sobriety and decorum within the lodge-rooms. Perhaps because of this problem, the Lodge in 1822 was again involved in a discussion of relocation. Amidst a strong opposing vote the motion was passed to relocate. In September, 1822, the Lodge members voted to have a dinner at the expense of the Lodge and that members be allowed but two refreshments of liquor at any meeting at the expense of the Lodge. It is not clear whether there was a double-barreled vote or if the two matters were considered separately. In January, 1824, the Lodge was installed in its new quarters. Interestingly enough, this structure was built in conjunction with the Sutton School District at a cost of $714.92. In June of that year, Olive Branch Lodge made its first visit to Millbury, destined to be its future home. St. John's Day was observed in'Benedict Hall located on the Old Common, Millbury. A procession was formed at the hall and the brethren proceeded to the meeting house (now the First Congregational Church in Bramanville.) Following the discourse a procession was formed and the members returned to the hall to partake of a sumptuous meal and entertainment in which the ladies and neighboring clergymen participated. The participation of ladies in a Masonic observance is the first officially recorded. Growth of the Lodge and difficulty of travel resulted in Oxford and Dudley applying for and receiving permission from Olive Branch Lodge to institute Lodges of their own. The record reads, "That it was voted to grant these requests and to also attend ceremonies of the Grand Lodge in instituting the new Lodge in Oxford". Our early historians note that in 1830 the first manifestations of the unrest attending the Anti-Masonic excitement became apparent in Olive Branch Lodge. This excitement was a period of persecution and violence, which swept the entire nation and lasted for some twenty years. It began when a certain William Morgan, a dissolute character of bad reputation threatened to write and publish certain articles which were to be entitled an "Exposition of the Ancient Craft of Masonry". These articles were to be published in collusion with David C. Miller, publisher of a weekly paper in Batavia, New York. His reputation was on a par with Morgan's— worthless. Morgan suddenly and mysteriously disappeared and was never definitely seen again in Batavia. His disappearance aroused violent repercussions. Public clamor charged the Masons with responsibility for his disappearance. Other uglier charges were made covering the whole gamut of crime. The charges were accompanied with persecutions and violence. The violences and excesses in some areas became so great that many Lodges surrendered their charters and ceased to exist. Many men of Masonic affiliation dared not attest to being a member of the craft. However, during the long years of trouble and danger, Olive Branch Lodge continued to hold meetings in a quiet and steadfast manner. The urge to move again resulted in the Lodge deciding to move to Wilkinsonville. This was done in 1845 and thus began a period of dissatisfaction with the meeting accomodations in both Sutton and Wilkinsonville. Some meetings were even conducted in the town of Webster. Finally, in 1859, the Lodge voted to hold all future meetings in the Town of Millbury. The new quarters were established in the Old Arcade Building. Finally in 1872, a new hall was constructed in the Rhodes-Simpson block on South Main Street at a cost of $2888.33. After ten prosperous years, misfortune overtook the Lodge when on the morning of March 11, 1882 it was completely destroyed by fire. Among the irreplaceable losses were the ancient and valuable Bible presented by Isaiah Thomas. Fortunately, the Lodge records, the altar Bible, the all precious charter, and the Master's Square were saved. The zeal of our Millbury brethren was demonstrated by a new building being constructed of durable brick. The new lodge-room with its starry-decked ceiling, its freize of symbolisms, the embellished Master's station, the two symbolical paintings to the right and left were to make our new Lodge one of the most beautiful in the State. March 12, 1888 is a memorable day in the annals of New England. It happened to be the day of the great blizzard. It was also the date of the regular meeting of the Lodge. Despite the hazards of traveling four courageous Brothers Worshipful Master, Humphreys; Secretary, Crane; Tyler, George Gates and Brother Charles H. Hakes walked to the Lodge and transacted the evening's business. They thus maintained the Lodge record of continuous sessions since 1797. A similar incident again occured in 1899 when six brethren appeared at the lodge-room to maintain a record still intact today. "To the members of Olive Branch Lodge, A.F. & A.M. My sister and myself, great-grand daughters of Isaiah Thomas, who, as we are informed, was Grand Senior Warden of the Grand Lodge of Massachusetts and signed your charter as such, Paul Revere, being Grand Master at that time, have decided to present to your Lodge a portrait of our great grand-father, an heir-loom which was presented to our mother by him personally and which we, as the only living descendants of that branch of his family, desire to place in the hands of those who we are assured by Mr. Humphreys will hold it in great veneration. We also include the gift of a Bible of great antique value, printed by him in 1791. Knowing yours was destroyed by fire, we trust this will also be acceptable." These gifts were graciously given by Clara and Mary Randall. Of little historical note, but worth mentioning is the fact that the Lodge voted to install a telephone in the Lodge in the year 1909—a most desirable convenience for the brethren of that time. In the same year action was taken to ensure that every Past Master should be so honored with a Past Master's Jewel. When William Howard Taft was elected President, the Lodge voted to confer an Honorary Membership on the foster-son of Millbury. His mother, Mrs. Louisa M. Torrey Taft was born and reared in Millbury. In his youth, President Taft spent many of his boyhood days in our Town, attended its public schools, fraternized with its youth, and participated in sports, especially baseball. The President's aunt, Miss Delia Torrey, was well-known in Millbury for her "apple pies". The President visited Millbury to observe his 55th birthday anniversary at the home of his aunt. An oral invitation was extended President Taft to visit the Lodge. On the evening of September 14th, 1912, the Lodge opened to receive the President of the United States. He was tumultuously greeted by the assembled Brethren and was cordially welcomed by Wor. Master James W. Robertson. He was thereupon escorted to the East where he was seated at the Worshipful Master's right where he received the respectful greetings of the Brethren individually, to each of whom he accorded a smiling and cordial hand clasp and words of greeting. The visit was a brief one but memorable to all in attendance that evening. The year 1914 marked the passing of Bro. Ira N. Goddard. He was 84 years old, and served as Town Clerk for 61 years and achieved the distinction of having served in that office continually longer than any other Town Clerk in the United States, so far as could be determined. In 1925 Worshipful Brother Edward F. Hull was seated as Master. It was one year short of fifty years since his father, Worshipful Brother Samuel E. Hull, was similarly inducted in 1876. The second such father and son combination occurred when Worshipful Charles N. Gurney occupied the Master's Chair in 1944—45 and his son, Worshipful Charles N. Gurney, Jr., was Master in 1961-1962. November 22, 1928 will ever be a red-letter day in the history of the Lodge. On that date, the Lodge became the proud possessor of a permanent home. It had occupied the Armsby premises for forty-four years as tenants. With the purchase of the Armsby building it could now be called the "Masonic Block". During a period of 125 years the Lodge had occupied some ten domiciles from its humble beginnings in Campbell Hall, Oxford. The Second World War might be noted for the manner in which many candidates were made members of the Craft. The Grand Lodge granted dispensations permitting the Lodge to confer the Entered Apprentice and Fellowcraft Degrees in one evening and the Master Mason Degree some four days later. In the case of one candidate, the three degrees were conferred in just two evenings. There is little that is dramatic or exciting in the course of Lodge life. The records often seem repetitious and much of it historically unimportant and therefore not included. But minor events are really the heart and soul from which more important events occur. It is a fact that the proceedings of any Lodge are usually shaped and controlled by a group of the active and more prominent brethren, whose individual efforts steer the proceedings of the Lodge especially in important matters. It is fortunate that Olive Branch Lodge has possessed such outstanding leadership. Its history is replete with the names of such leaders and its progress testifies to the wisdom and devotion of their efforts. Whatever the future holds for us all let each be reminded of these words, "May the tenets of our profession be transmitted through Olive Branch Lodge, pure and unimpaired, from generation to generation". The festival of St. John the Baptist, will be celebrated at Wilkinsonville, Mass. on the 24th inst. by Olive Branch Lodge and Sutton Royal Arch Chapter; and also the ceremony of laying the Corner Stone of the Episcopal Church, about to be erected in that place will be performed agreeably to ancient usages. The neighboring Chapters and Lodges, together with all others connected with the craft, are respectfully invited to attend, and unite in the festivity and solemnities of the day. The procession will form and ceremonies commence at 11 o'clock, A. M.
The Olive Branch Lodge, situated in Sutton, holds four regular communications in a year, viz. on the Monday preceding, or at the full moons, in February, May, August, and November, and the Communication in February, is their annual Meeting, for the choice of Officers; the following is a correct list chosen and appointed in February, A. L. 5831. Joseph L. Freeman, J. W.
John W. Whipple, J. D.
Daniel G. Livermore, S. S.
Simon Tenney, Jr., J. S.
Daniel L. B. Goodwin, Chaplain. Jonas B. Sibley, John F. Barton, Marshal. Jonas L. Sibley, Daniel Tenney, Com. of Finance. Olive Branch Lodge was chartered by the Grand Lodge of this Commonwealth in September, 1797, with authority to hold its meetings, in the town of Oxford, in the County of Worcester. It however, for the better accommodation of its members, was subsequently removed to the neighboring town of Sutton, where it remained until 1858, when it was again removed to the adjoining manufacturing village of Millbury, its present location. Its records, covering a period of seventy-five years, would undoubtedly furnish material for an interesting chapter in the local history of Masonry in the County where it is situated; but these are not' before us. It was one of the very few Lodges in the county of Worcester which survived the Anti-Masonic persecution and successfully triumphed over the fanaticism and maledictions of its enemies. Of its members who were " faithful found among the faithless," the names of W. Bros. Daniel Tenney, Jonas L. Sibley, and Asa Woodbury are the most strongly impressed upon our memory. Bro. Sibley was, during a part of the anti-masonic period, United States Marshal at Boston, having his family at Sutton; Bros. Tenny and Woodbury were manufacturers, doing business at Sutton or Millbury. They were all gentlemen of high social position, and enjoyed the respect of their fellow citizens ; but what was of equal importance to the welfare of the Lodge, they were all firm, consistent and determined Masons. They are all now dead, but they have left behind them memories which should be dear to their successors in the faithful old Lodge which they preserved and honored. M. W. Sereno D. Nickerson, Grand Master. R. W. Percival L. Everett, Deputy Grand Master. R. W. Charles Kimball, Senior Grand Warden. R. W. Tracy P. Cheever, Junior Grand Warden. W. John W. Robinson, as Grand Treasurer. R. W. Charles H. Titus, Recording Grand Secretary and acting Grand Chaplain. R. W. Charles W. Moore, Corresponding Grand Secretary. R. W. T. E. St John, D. D. Grand Master, [MAWorcester11_1867-1882 Dist. No. 11]. R. W. George E. Stacy, D. D. Grand Master, Dist No. 12. W. William H. Chessman, Grand * * W. Horace J. Joslin, as Senior Grand Deacon. W. William H. Murray, as Junior Grand Deacon. W. Henry C. Wilson, W. Joseph B. Knox, Grand Stewards. W. Nelson R. Scott, W. Edw. W. Bardwell, as Grand Pursuivants. Br. Frederick A. Pierce, Grand Tyler. The ceremonies of Dedication were in accordance with the established ritual, and were rendered with a precision and completeness such as is rarely met with on such occasions. At the conclusion of them the Grand Master addressed the brethren of the Lodge, congratulating them on their prosperous condition, and the fine accommodations which they had provided for their future labors. We have however no room left in our pages for any suitable abstract of the address, and must be content with saying that it was an earnest, sensible, and appropriate charge to the brethren on their duties and obligations as masons. It was listened to with close attention, and we do not doubt gave entire satisfaction to the listeners. The exercises were interspersed with music by a select choir. An earnest and eloquent prayer by the acting Grand Chaplain concluded the ceremonies. Irving B. Sayles — W. M.
Nathan H. Sears — S. W.
Martin V. Walling — J. W.
Samuel N. Rogers — Sec. James Dyson — S. D.
Samuel D. Walters — J. D.
Rev. Wm. R. Tisdale — Chaplain. Peter Simpson, Jr. — Mar. Henry W. Sweetser — S. S.
Albert A. Bradford — J. S.
Charles H. Holbrook — I. S.
Thomas K. Book — Tyler. The brethren having assembled in the banquet hall, to the number of about three hundred, the Grand Master opened the ceremonies by a pleasant welcome to the bounties spread before them. These having been disposed of, he commenced the more intellectual part of the ceremonies in a neat and humorous address, which he concluded by calling up B. W. Bro. C. W. Moore, a synopsis of whose response, on the origin and character of anti-masonry, is given. He was followed by R. W. Bro. Sheppard, in an earnest and acceptable speech. Then came the reading of the "Declaration," and another speech by the Grand Master introducing R. W. Marshall P. Wilder; and then in succession, speeches by R. W. P. G. M. Gardner; R. W. Abraham A. Dame; P. G. M. Winslow Lewis; by the Grand Master introducing P. G. M. Bishop Randall of Colorado, who made a capital speech; by P. G. Ms GMHeard Heard, GMWCoolidge Coolidge, GMDame Charles C. Dame; by Bev. Dr. Quint, Grand Chaplai ; Bro. Lovell Bicknell; the Grand Master calling up P. D. G. M. Charles L. Woodbury; and another by R. W. D. D. G. M Avery. This concluded the speaking. In addition to the speeches however, the pamphlet contains the names of the original signers of the Declaration, and the names of all the Brethren who were present and participated in the festivities. We hope measures may be taken to have another edition of this pamphlet printed and placed on sale at cost, so that every member of our Lodges may have an opportunity to make himself acquainted with its interesting contents. Olive Branch Lodge, of F. and A. M., lost by the recent fire some very ancient Lodge jewels, swords, etc., which have been in the possession of the Lodge ever since it w.as chartered in 1797, and were of course highly valued for their antiquity. Some of these articles have been found among the ruins, and will be preserved as relics. One of the most highly cherished of the articles lost was a Bible, which was presented to the Lodge in 1797, by Isaiah Thomas, Senior Grand Warden of Massachusetts at that time. This book was appropriately inscribed in the handwriting of the giver. The original charter was fortunately preserved. It is a most venerable looking document, printed upon parchment, and contains the names of the 23 original members. The Lodge was first founded in Sutton, and afterwards removed to Oxford, Webster, and thence to Millbury, where it has since remained. Olive Branch Lodge A. F. & A. M. observed its 150th anniversary with a banquet in the Town Hall Sept. 15. A feature was the reading of the history of the lodge by Past Master James Higginbottom. The history was written by Gustav A. Neudeck, a member of the lodge for 54 years and a past Worshipful Master. A special communication of the lodge was held at 5.45 and at 6.10 Grand Master Samuel H. Wragg of Dedham and other grand officers of the Massachusetts Grand Lodge received. The grand master was toastmaster at the banquet and delivered the principal address. Visiting grand officers included: Raymond C. Warmington, Deputy Grand Master; George D. Robertson, Senior Grand Warden; Paul L. Perkins, Junior Grand Warden; Rev. Dr. Thomas S. Roy, past Deputy Grand Master; Rev. Francis D. Taylor, past Deputy Grand Master; Frederick H. Hale, Grand Treasurer; Frank H. Hilton, Grand Secretary; Percy H. G. Harris, District Deputy Grand Master, Worcester 22d; Raymond A. Warden, District Deputy Grand Master, Blackstone 20th; Clifford A. Green, District Deputy Grand Master, Brookfield 21st; Whitfield W. Johnson, Grand Marshal; Will Allen Gray, Grand Lecturer; Laurence E. Eaton, Grand Sword Bearer; Paul B. Morrison, Grand Standard Bearer; Clayton F. Fisher, Grand Pursuivant; Laurence M. Johnson, director of administration. The charter of the lodge is dated Sept. 14, 1797. It is signed by Paul Revere, who was Grand Master at the time, and Isaiah Thomas, Senior Grand Warden. The name, "Olive Branch," was proposed by Jonathan Harris, the lodge's first Junior Warden. The history of the lodge parallels that of the United States for George Washington was President when the original plans for the organization were made. Members took part in a memorial service in Oxford soon after Washington's death. Meetings were held originally in Oxford, then in West Sutton. Sutton Center, Wilkinsonville. back to West Sutton, and finally in 1860. the lodge moved to Millbury where it has been located since. Three buildings have been used in Millbury. One was destroyed by fire, causing the loss of a large part of the lodge's possessions. The records, charter, Bible, and the master's square were the only articles saved. The present quarters in the Masonic Building on South Main street, have been occupied since 1884. The former President, William Howard Taft, visited the lodge and was made an honorary member during his term as President. — Worcester Eve. Gazette, Sept. 1947. This page was last modified on 10 October 2018, at 14:11. This page has been accessed 66,091 times.